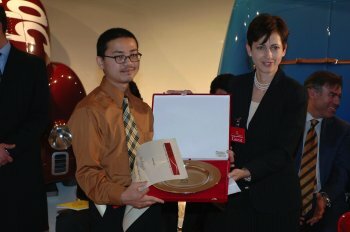 Alcoa announced today that it has awarded Shigenori Maeda, a design student from the College for Creative Studies of Detroit, a special design prize for Excellence in Design for Aluminum, for his model "612 Lafayette" Ferrari. Maeda designed the Ferrari for the "Ferrari: New Concepts of the Myth" design competition, an international project organized by Ferrari in cooperation with Pininfarina. Maeda will receive an aluminum reproduction of his model. Alcoa, who manufactures aluminum spaceframes for Ferrari's F430 and 612 Scaglietti sports cars, supported the competition, which included students from four of the world's most prestigious design schools. In addition to the College for Creative Studies, winning design concepts were submitted by students from the Coventry University - School of Art and Design in England, the Istituto Europeo di Design in Torino, Italy, and the Tokyo Communication Arts College in Japan. 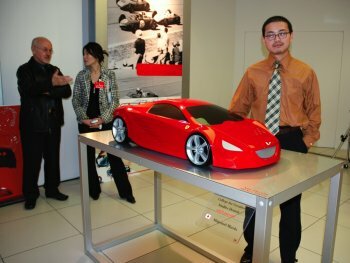 "The purpose of the competition was to challenge some of the best young minds on the planet to creatively consider what future generations of aluminum-intensive Ferraris might become," according to Misha Riveros-Jacobson, president of Alcoa Advanced Transportation Systems, the business that supplies Ferrari. Ferrari and Alcoa have recently announced the formation of a long-term strategic partnership focused on creating advanced aluminum spaceframe technology for future generations of Ferrari vehicles. Three successful generations of spaceframes for the 360 Modena, the 612 Scaglietti and the F430 have proven that the Ferrari-Alcoa partnership is capable of innovation as well as the implementation of new technologies on production lines in Modena. The relationship with Alcoa is already a case-history and it will be the model for future relationships with other Ferrari suppliers. Alcoa is the world's leading producer and manager of primary aluminum, fabricated aluminum and alumina facilities, and is active in all major aspects of the industry. Alcoa serves the aerospace, automotive, packaging, building and construction, commercial transportation and industrial markets, bringing design, engineering, production and other capabilities of Alcoa's businesses to customers. In addition to aluminum products and components, Alcoa also markets consumer brands including Reynolds Wrap(R) foils and plastic wraps, Alcoa(R) wheels, and Baco(R) household wraps. Among its other businesses are vinyl siding, closures, fastening systems, precision castings, and electrical distribution systems for cars and trucks. The company has 131,000 employees in 43 countries and has been named one of the top three most sustainable corporations in the world at the World Economic Forum in Davos, Switzerland.